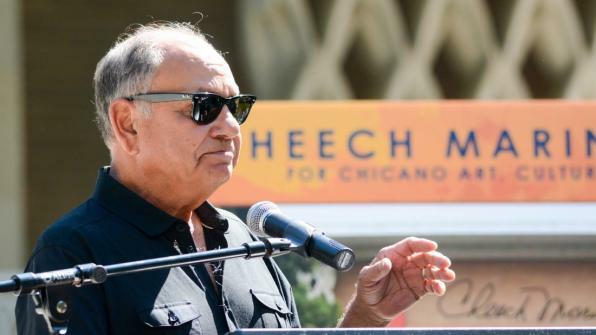 “`The Cheech Marin Center for Chicano Art, Culture, and Industry – which people already have nicknamed The Cheech – is officially a go for the Downtown-area of Riverside. Their local city council approved to replace their downtown library with a cultural center, displaying Marin’s renowned 700-piece Mexicano art collection. A third-generation Latino-American, he hopes the art center will be accessible to five universities in the area. “`Residents burst into applause after the vote, and their comments reflected excitement and anticipation of how the Marin Center could raise the city’s profile, and showcase a culture the art world has neglected. “`The agreement gives the city, Marin, and Riverside Art Museum up to a year, to raise $3 million of an estimated $5 to $7 million, the project is expected to cost. The city will continue to own the building, Marin will lend his art, and the art museum will staff and run the center. Measuring about 60,000 square feet, the edifice is the current home to the Riverside Public Library, which plans to vacate the structure and move a few blocks away. “`Melissa Richardson Banks, who manages Marin’s art collection, said Cheech couldn’t attend the council meeting, because he is in Atlanta filming a movie. However, he texted her hourly, hoping for a decision. The vote was unanimous. After the vote, Banks stood at a lectern, and put her cell phone to the microphone, so Marin could express his thoughts. This entry was posted on Wednesday, May 17th, 2017 at 5:12 pm	and is filed under Blog by Manny Pacheco. You can follow any comments to this post through the RSS 2.0 feed. Responses are currently closed, but you can trackback from your own site.